Well, it’s finally cold here in New York. Mother Nature told me in a rather stern manner that I could no longer wear shorts on my long runs. She broke my heart. This past week was rather jam packed and I must say it was the kind of busy that I really enjoyed. I got to pretend I was super elitist and went to the opera not once but twice in one week. On Thursday evening, I went to see An Enchanted Island with Joyce DiDonato and some guy named Placido Domingo. Super, super fantastic and all of you need to go see this. I headed back to the Met on Saturday to see Tosca with Patricia Racette and Roberto Alagna. It is the infamous Luc Bondy production that still has some flaws but you can easily look beyond that with Racette. My goodness that woman can sing! Although I’m thinking some of the mermaids from An Enchanted Island can make an appearance at the start of Act III in Tosca to help move a certain chess scene along. Going to the opera on Saturday meant that I had to move my usual Saturday long run to Sunday. Then I looked at the temperature on Sunday morning, compared it to Monday’s and decided to tackle my 14 miles on Monday instead. I am training for a half marathon in Miami not the North Pole. Glad I did, while it was still pretty cold on Monday afternoon, I was able to at least shed my gloves and feel a little less bundled up. I got a good sweat on and while my time wasn’t exactly what I was hoping for I’ll take it. It hurt at points because certain body parts of mine always hurt when I run in winter no matter how much I warm up or stretch. I’m looking at you IT band area by my hip. It was also nice, because it was a Monday and a holiday and the path along the West Side Highway was practically empty and it felt good to run all the way downtown and enjoy the view without having to watch out for crazy tourists. I really do think this is one of my most favorite places to run in the city. At some point during my run, I think it was mile 10 or 11 I realized I could no longer hold off on getting myself a new pair of shoes. I knew I was hitting that 300-500 mile threshold but when it feels like you are really hitting the pavement you can’t ignore it any longer. Turns out I had actually the 500 mile threshold with my current pair. Wouldn’t you know it that served as the motivation to keep moving and finish that run — new shoes at the end! 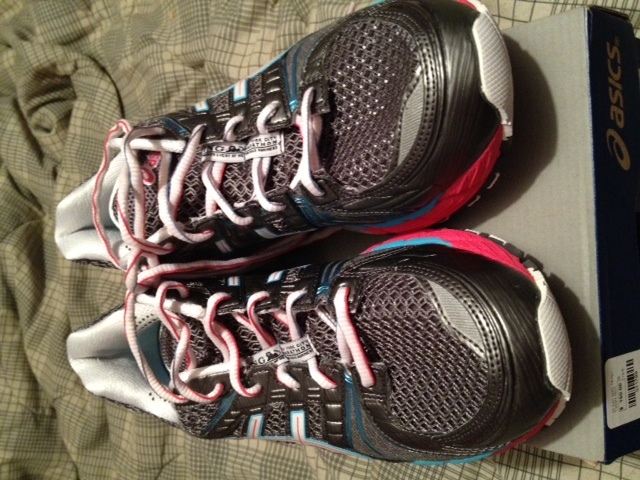 My new shoes, they have bright pink and blue on them. Since my gear was already stashed at JackRabbit I made a beeline to the store and picked up a brand new pair that is way more flashy than I normally get. Maybe I was hoping that their brightness would warm me up. I like JackRabbit because they always have my size. I normally wear a size 11 and I can get the Asics Kayanos in a 10.5. I don’t think my foot is that big even though it does feel as though I have skis for feet at times. But these shoes are extra special, supposedly. They are the NYC Marathon shoe. 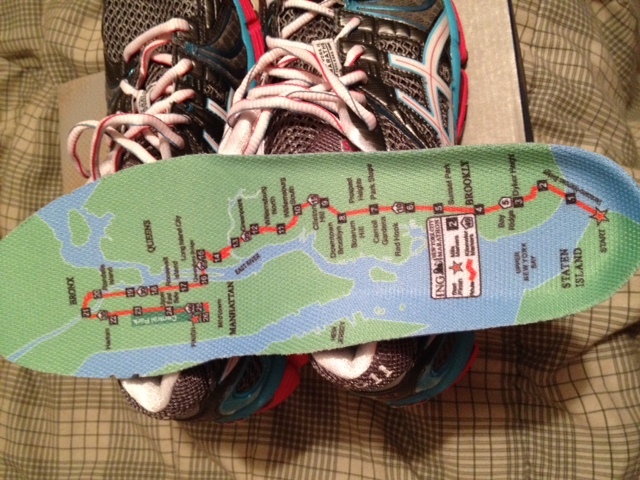 They have NYC written on the back, the NYC Marathon logo on the tongue, and just in case I get lost running the marathon course I can always take out the insole and look at the map. See, I have a map just in case I get lost on the marathon course! Overall, I’m happy with the shoes and happy with my training for this half. I have been able to almost all of my mid-week training runs and did not miss a single long run. I feel some much better going into this half than I did going into the Nap to Sonoma Half. I’m not sure I’ll be able to PR but I do feel I’ll get closer to that mark that I have been getting farther away from the past few half marathons that I ran. If I can do better than I did at my excuse me I’ll run Grete’s Great Gallop Half Marathon I’ll be very happy. Now I start my mild taper. I’ve got an eight mile long run this weekend and don’t run anything more than four miles next week. I’m looking forward to this race, big time. This entry was posted in Half Marathons, Races, running, travel and tagged half marathon, ING Miami Half Marathon, JackRabbit Sports, joyce didonato, miami, Napa to Sonoma Half Marathon, opera, patricia racette, placido domingo, roberto alagna, Running, shoes. Bookmark the permalink.